Book Jacket: "Don Fidencio and Don Celestino are brothers with more in common than either will admit: fiercely independent, sharp as tacks, and stubborn. Between them stands an argument so old neither wants to concede. The dispute---over their grandfather's alleged kidnapping in Mexico more than a century ago and the truth of their family heritage---appears destined to die with two men too consumed with the past to ever put it behind them. Enter Socorro, the delightful and kindhearted Mexican housekeeper with whom Don Celestino falls in love. She hasn't lived nearly as long as the brothers, but she's learned that people can indeed run out of time to make amends. She leads the begrudging pair on a quest to end their estrangement---while they still can. In a story full of warmth and wonder, the unlikely trio ventures far into Mexico and deep into the past, following their only lead: that of the lost, and possibly mythic, El Rancho Capote, home of the brothers' grandfather. As the two men test the limits of their pride and patience, they uncover long-hidden truths both painful and redemptive, and learn it's never too late for a new beginning. 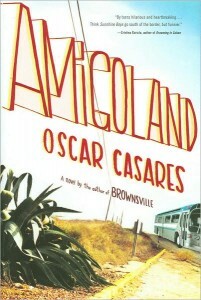 With the winsome prose and heartfelt humor that won widespread accolades for his story collection, Brownsville, Oscar Casares's novel of family lost and found radiates with the generosity and grace of a truly original voice in American fiction." Taryn's Review: If the book jacket for this story is correct, then this book went way over my head. I mean, waaay over. I didn't personally find the brothers to be similar at all other than being stubborn about petty things. Don Fidencio began his story in a nursing home, and while I know the author was trying to be funny with giving Fidencio's cohorts names like The One with the Hole in His Back, it was draining to read. The beginning was my least favorite part of the book and I contemplated quitting because I just wasn't getting into the story at all. Don Celestino was a widower of only a few months when he began sleeping with his housekeeper, Socorro. Socorro was so focused on making a public relationship/life with Celestino that I felt like she was being selfish; Celestino's wife death was fairly recent, which was one of his main arguments for not opening up to Socorro. He feared being hurt again and and he also feared what his children and friends would think to see he had moved on so soon. Socorro, in her desperation to make herself a bigger part of Celestino's life, urged him to reach out to his estranged brother, Fidencio, as she would like to meet his family (and she was upset he didn't tell her sooner that he had a living brother). I don't know why Celestino relented. He and Fidencio hadn't talked in years and they just bickered for the most part when they did meet. The arguing kept really disillusioned me and made me bored with the book. I'm not particularly glad I finished the book, but I didn't hate it. Overall, it was just kind of blah for me. I think Casares is a good writer, but the story itself didn't catch my imagination or light a fire in me to keep reading. I might pick up the author's other book, but I can't say I would recommend this one.